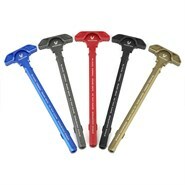 In this article, we will review the top 10 rated AR-15 charging handles. We will equip you with the information you’ll need to choose a charging handle that delivers the best performance and experience for your AR-15 firearm. But first, let’s cover the basics. 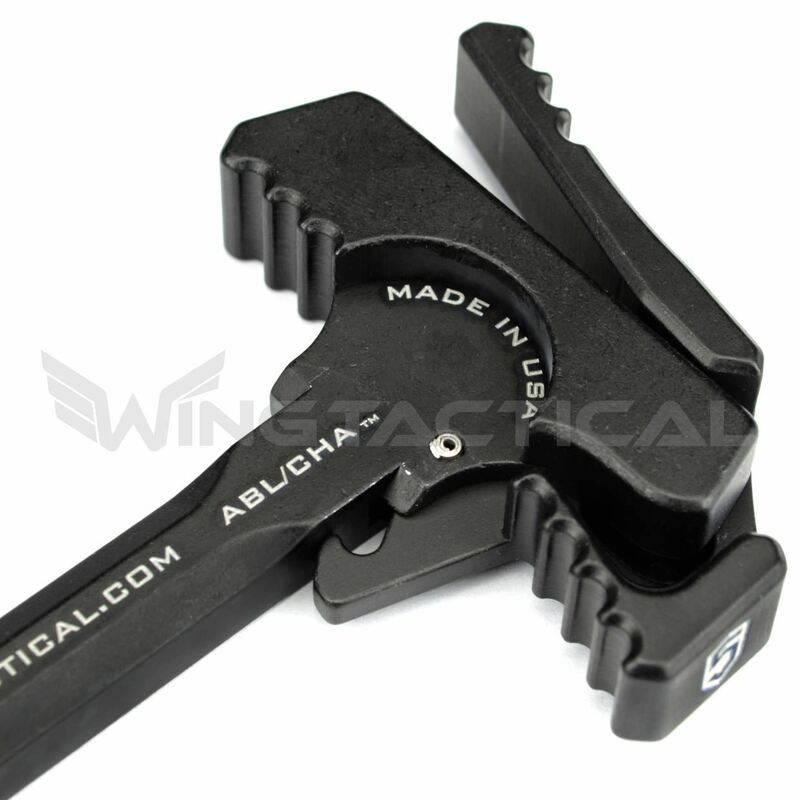 What is a Charging Handle? 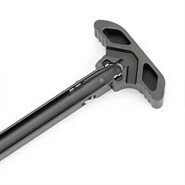 A charging handle can take many forms: on most firearms, it occurs as a hook from the side of the bolt, such as on AK-pattern rifles. On AR-pattern rifles, the charging handle is located forward of the stock and underneath the carrying handle/optic mount. Most AR-15s come standard with a mil-spec charging handle, which is fine if you just use your rifle for a casual day of shooting at the range. However, if you do more prolonged shooting activities, a regular charging handle may not be up to snuff. If you’re one of the many left-handed shooters that’s taken a liking to the AR-15 platform, you should consider changing your charging handle, because the AR-15’s standard charging handle, having been designed for right-handed shooters, is hard to use when behind a scope or other large optic. 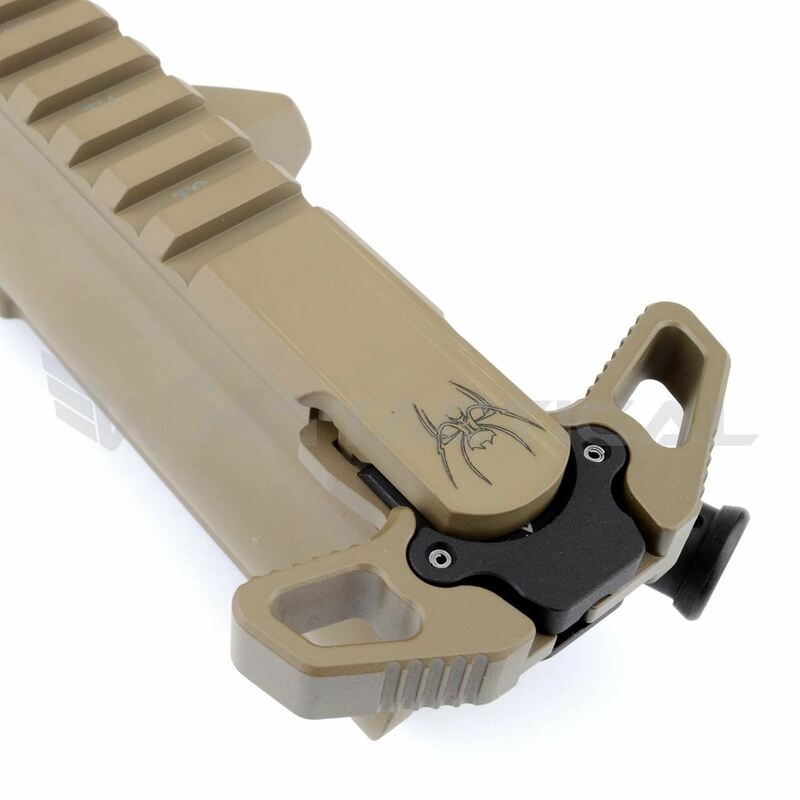 Built out of aircraft-grade 7075 aluminum and finished with Mil-Spec Type III anodized hardcoat, Radian’s Raptor ambidextrous charging handle is built with double latches on either side of the handle, enabling you to operate it equally as easily with either hand. 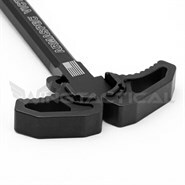 The deep serrations and forward angling of the charging handle ensure that you’ve got a secure grip when you need it. As part of its quality testing, Radian runs the Raptor charging handle through more than a million cycles, ensuring that it’s one of the best AR-15 charging handles out there, designed to serve you well, whether on the range or in the middle of the most stressful tactical situation. 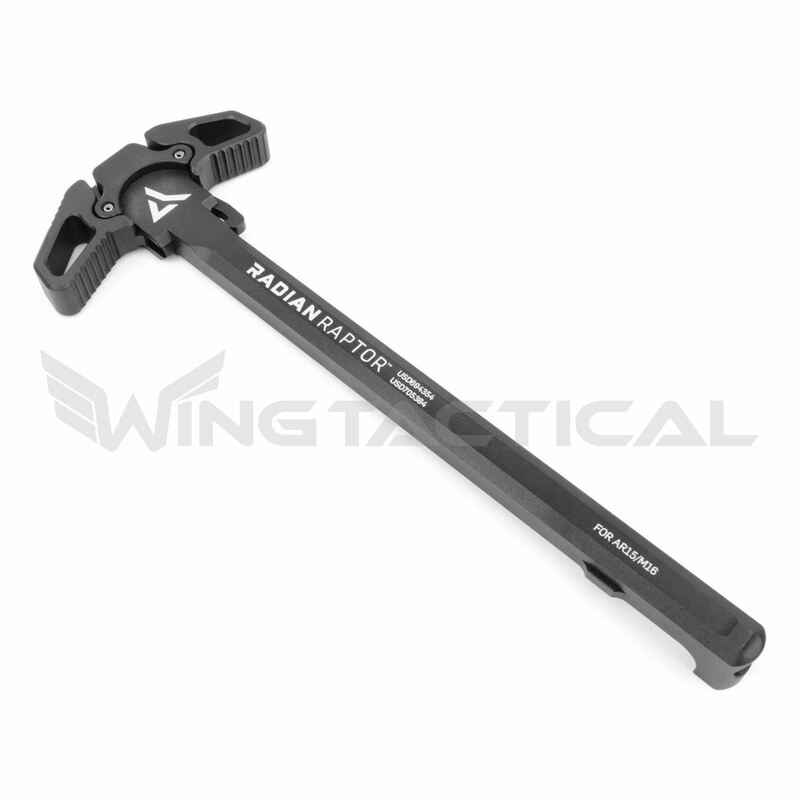 The Raptor charging handle has a 5-star rating based on customer reviews, with several of those customers mentioning specific things that they liked about the Radian Raptor such as the heavy-duty axis pins, the true ambidexterity offered by the Raptor and even the color matching. 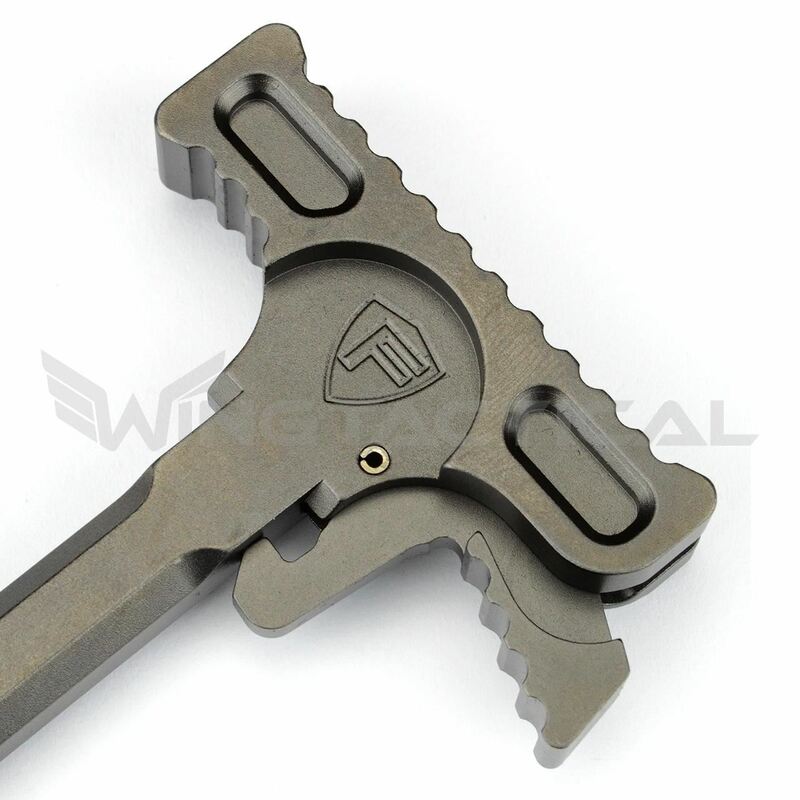 Much like the other Strike Industries charging handle reviewed earlier in this post, the Strike Industries AR-15 Latchless Ambi Charging Handle is made of aircraft-grade 7075 T6 aluminum and then finished with a layer of anodized hardcoat. This gives the charging handle a highly-polished surface, making for smooth charging and making the removal of any blockages easy as can be. 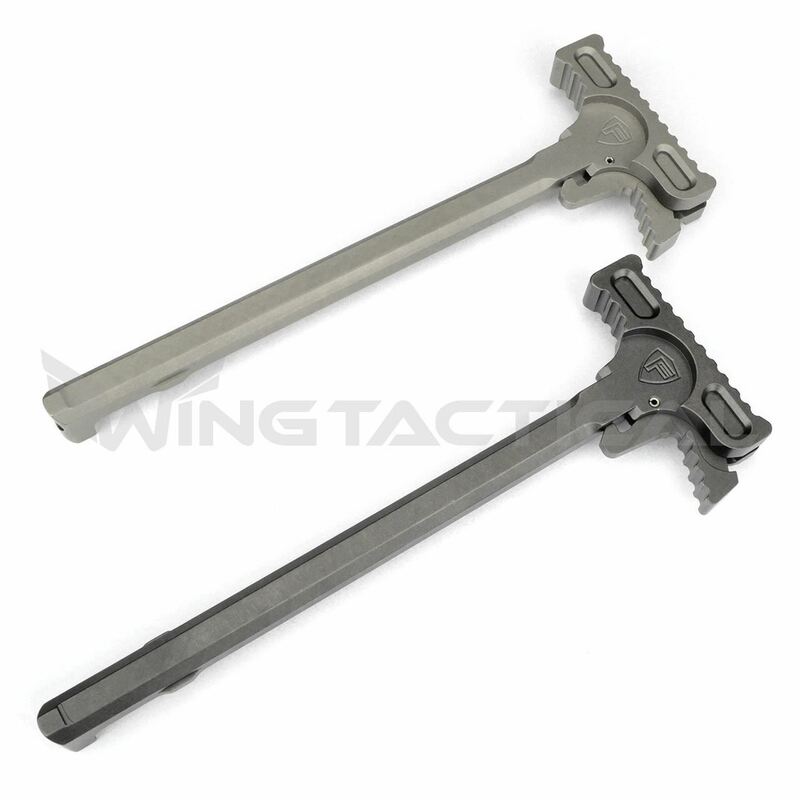 That same 7075 T6 aluminum composition makes the charging handle extremely durable. It will not fail you under even the most extreme situations. 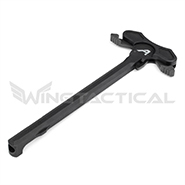 This Latchless Ambidextrous Charging handle has no traditional external latch and works equally well operated from either side. 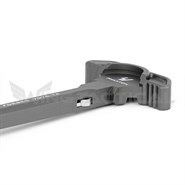 Customers have been solidly impressed with the Strike Industries AR-15 Charging Handle, enough so that it currently enjoys a rating of five stars out of five with the customer reviews to back it up. 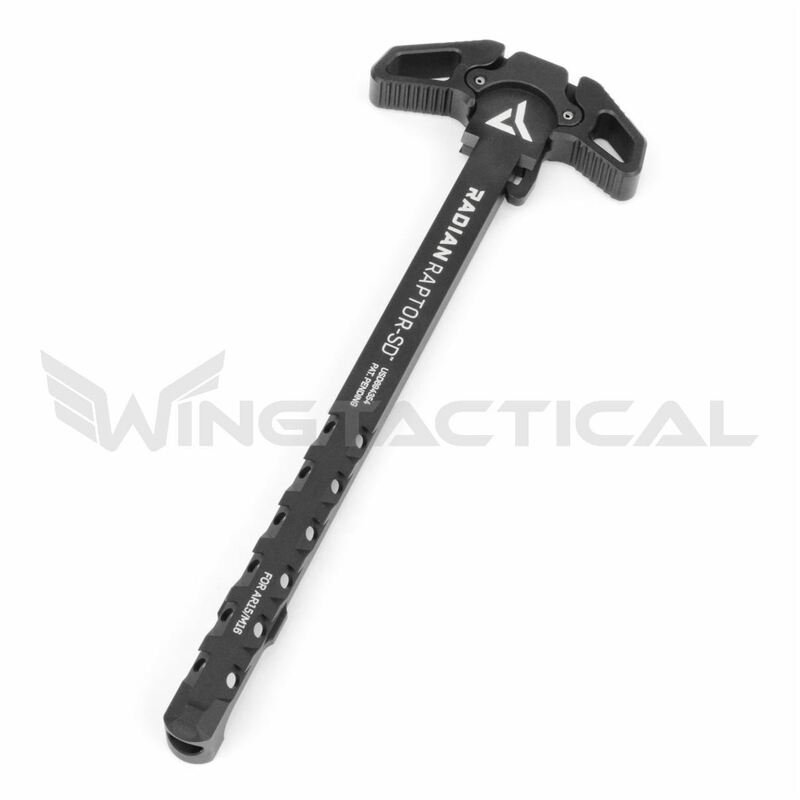 Machined out of solid billets of 7075 aluminum and finished with a coat of nickelene, the Hammer charging handle by Fortis is one of the most reliable charging handles on the market. 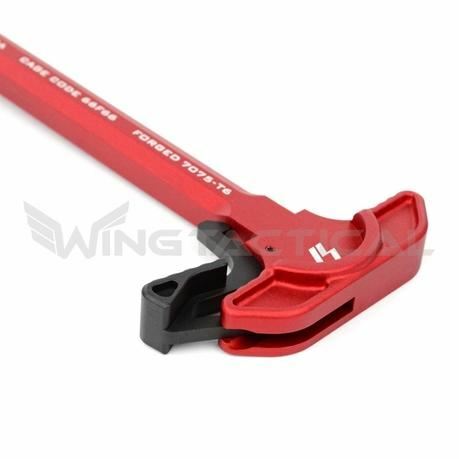 Because of its nickelene finish, the Hammer has a natural lubricity, meaning that charging the handle will feel incredibly smooth, while the deep knurling on the latch will ensure that you can get a solid grip on the handle exactly when you need it. 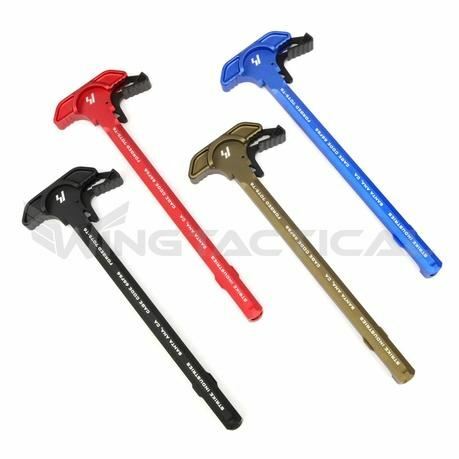 The nickelene finish also staves off rust and corrosion in addition to reducing friction wear, meaning that the Fortis Hammer charging handle will keep working even under the most grueling conditions. 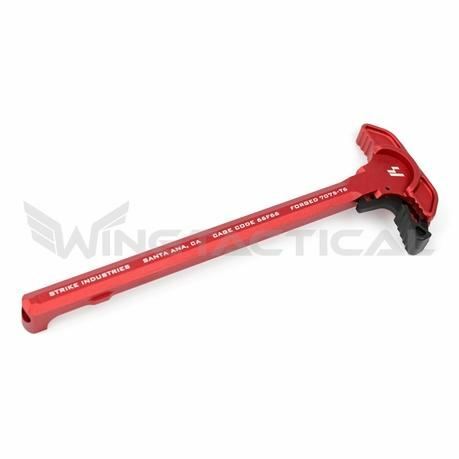 Fortis’ products have long had a reputation for excellence and the Hammer backs that up with a 5-star rating, with customers specifically noting how smooth the pull-back on the Hammer handles was. At least one user said that they’d run thousands of rounds through their AR with a Hammer mounted and had yet to see a sign of wear. 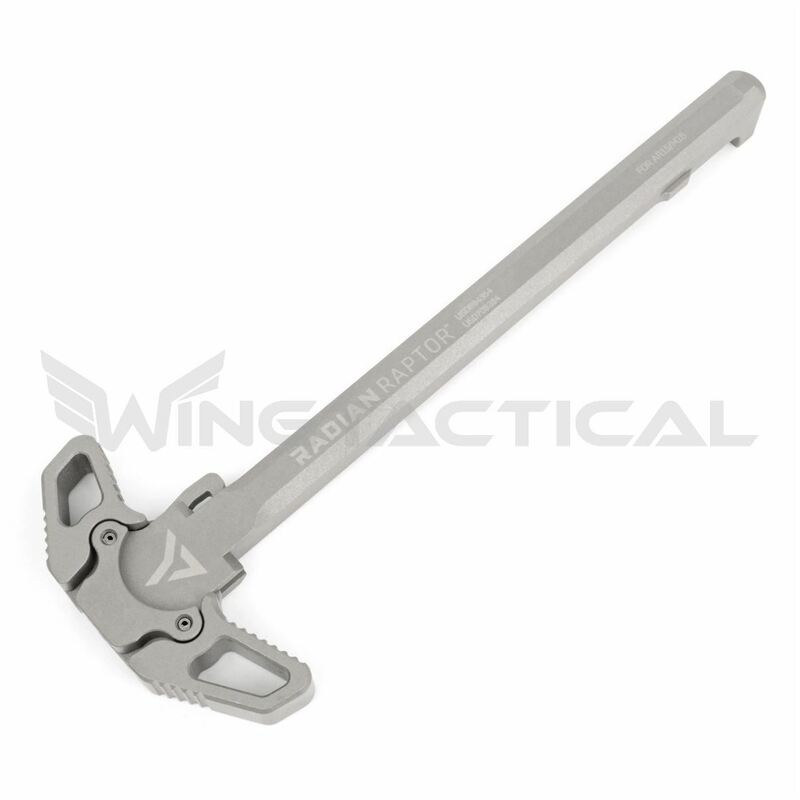 Built out of 7075 aluminum and finished with nickel-teflon NP3 coating, Radian’s Raptor ambidextrous charging handle has been cycled over a million times without failure to ensure that it will stand up to whatever punishment you can dish out. As part of the Raptor design, Radian’s charging handles enable the shooter to use either a “blading” motion with the palm or the standard finger/thumb grip to charge the firearm. The handle is designed for ambidexterity, making it perfect for lefties, righties or those shooters comfortable using either hand. 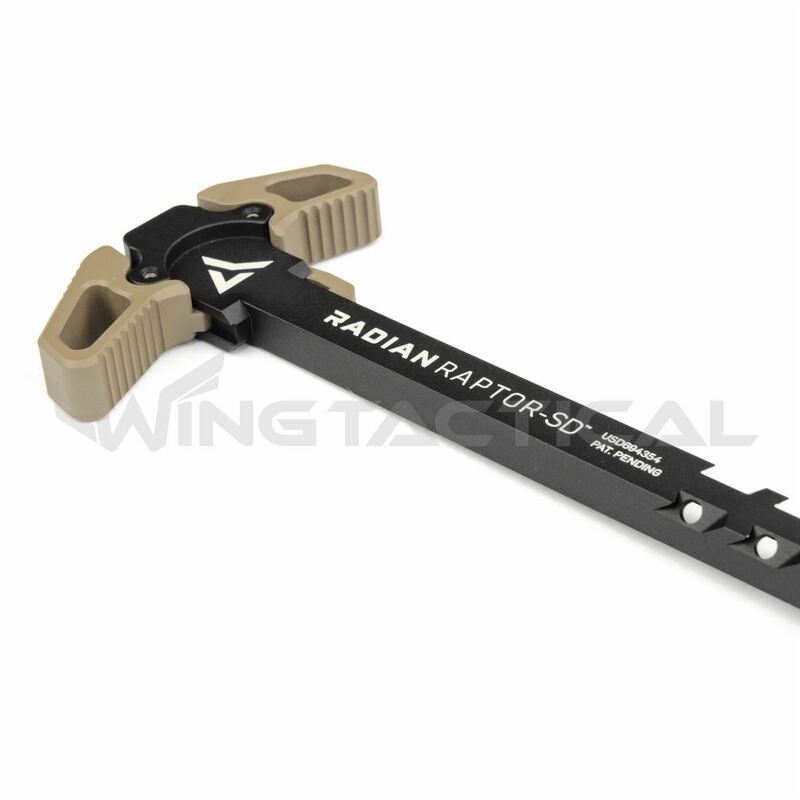 Radian does its best to put out top-quality firearms parts and this product’s glowing customer reviews have shown that the Raptor is just another in a long line of successes, with one customer calling the Raptor a professional-grade piece of hardware. 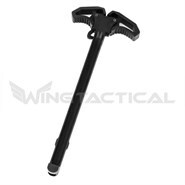 Machined out of 7075 T6 aluminum billets and finished with a coat of Mil-Spec Type III Class 2 anodized hardcoat, Aero Precision AR-15 ambidextrous charging handle is designed with the modern close-quarters combat (CQC) shooter in mind. Extended latches allow for more efficiency in CQC situations, but the under-sized roll pins of most latch systems mean that the entire latch is placed under a great deal of stress. When the roll pin fails because of this stress, it leaves the charging handle unsecured, placing the shooter in a precarious situation. 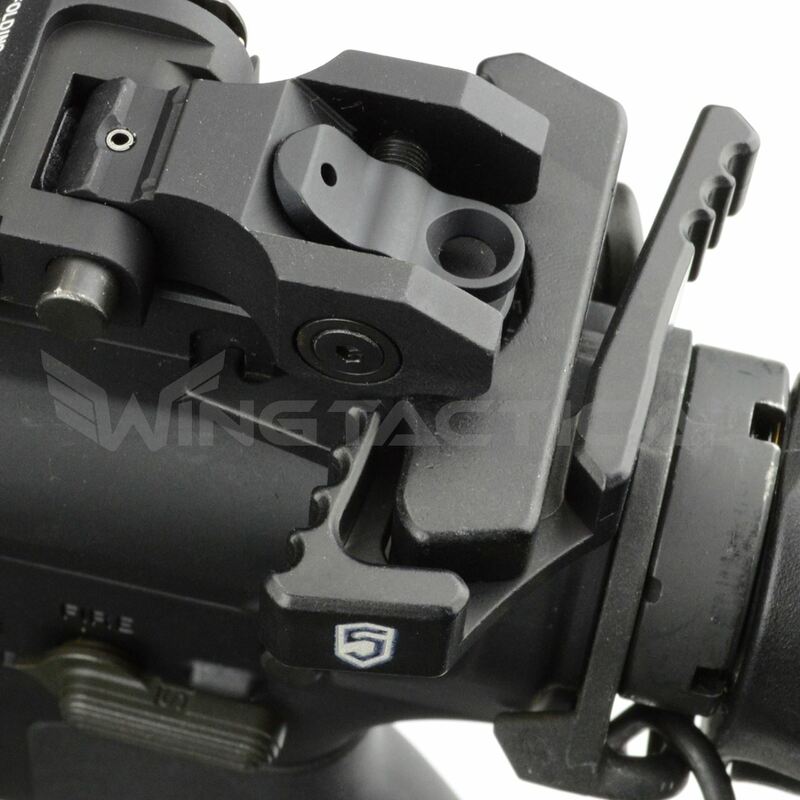 To combat this, the Aero Ambi Charging Handle is fitted with a backstop to restrict the backward motion of the handle. 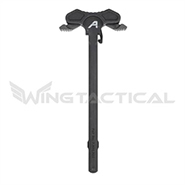 The Aero Ambi Charging Handle is also designed in such a way as to keep the movement of the charging handle in line with the weapon, as opposed to allowing it to torque outward. 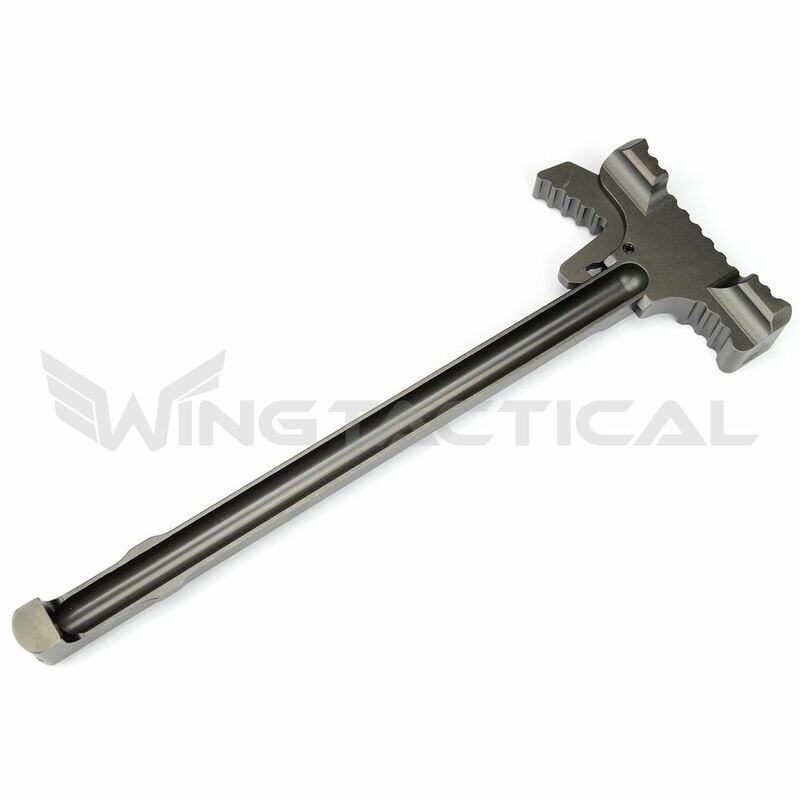 This means that the majority of stress during firing is directed into the charging handle itself, allowing the system to operate more smoothly. 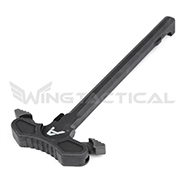 In addition to the backstop, this charging handle has been built with an extended and enlarged latch to facilitate ambidextrous shooting, with each latch surface sporting serrations, ensuring positive contact. 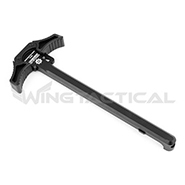 Smooth Operation - at least half a dozen of the reviews on the Wing Tactical website call particular attention to how easily the handle charges, with one user commenting about how the Aero Ambi Charging Handle solved the gas issues they’d been having with previous charging handles. 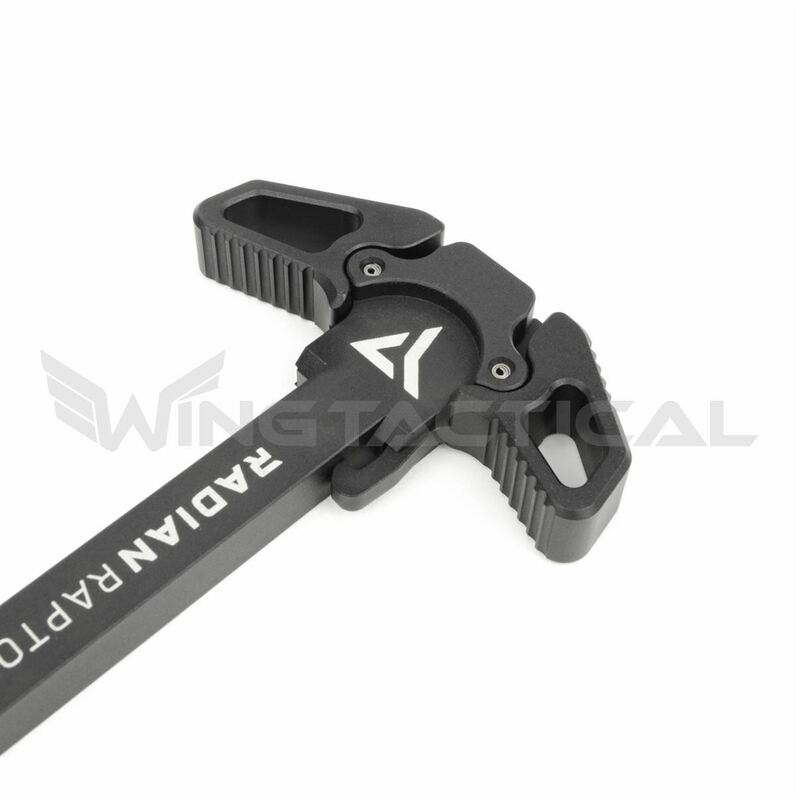 Built out of aircraft-grade 7075 aluminum and finished with a coat of Mil-Spec Type III anodized hardcoat, the Radian Raptor-SD ambidextrous charging handle looks like most other ambidextrous charging handles on the market. However, one look at the ported holes cut into the shaft will show that this charging handle is designed with suppressed rifles in mind. The ported holes cut into the shaft redirect the gasses from the upper receiver forward, away from the shooter, meaning that you don’t have to deal with powder burns or the soot marks of repeated blow-back. Instead, you can shoot comfortably and clearly without having to worry. 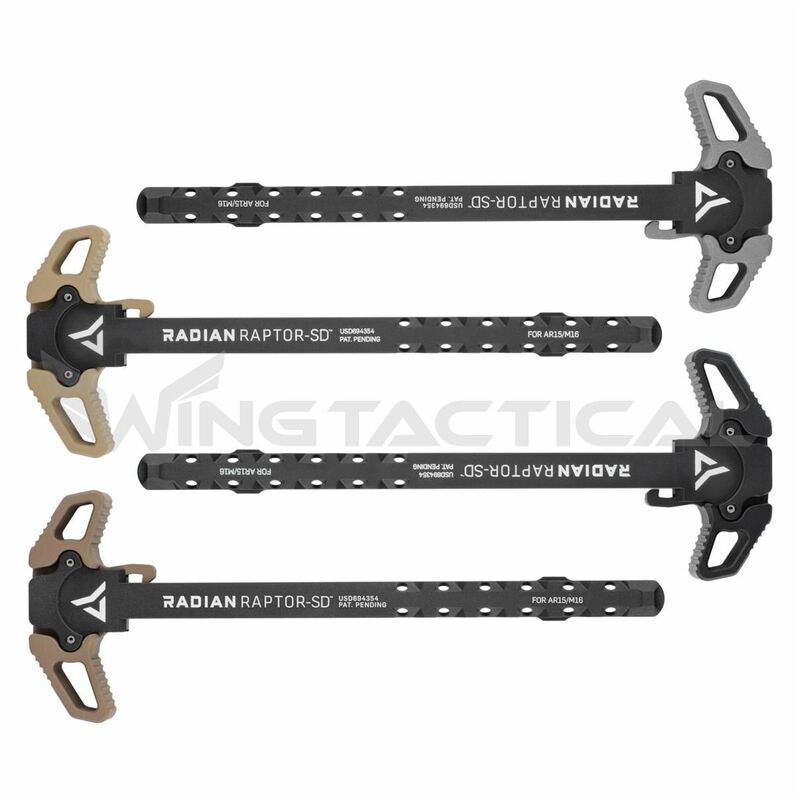 If you already own Radian’s earlier Raptor charging handle, worry not: the Raptor-SD is designed to fit in the same builds that accept the original Raptor charging handles. And just like the original Raptor, the Raptor-SD is run through a test of a million cycles to ensure that it will hold up where it counts. Since a normal-sized AR-15 charging handle can be difficult to engage with gloves on, Armaspec developed the Victory Ambidextrous Extended Latch Charging Handle to help solve that problem. Built out of 7075 billet aluminum and finished with a coat of anodized hardcoat, the Extended Latch Charging Handle has an enlarged latch and serrations on the latch itself in order to improve grip – no more fumbling around. The Victory Extended Latch Ambi Charging Handle is compatible with most AR-15 platforms, functioning simply as a drop-in upgrade to the regular charging handle. 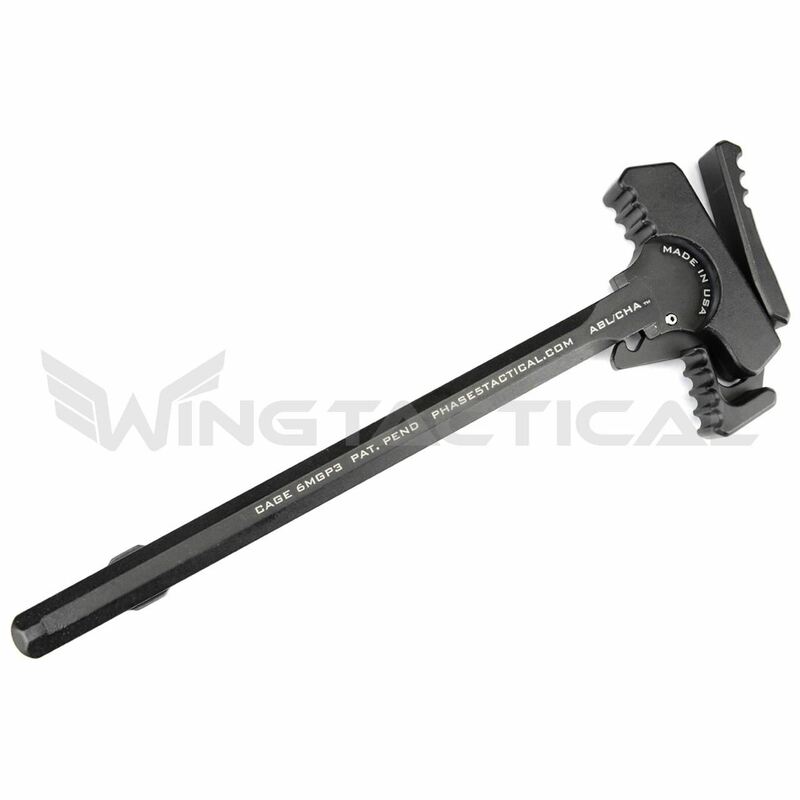 Not only is it easy to install and long-lasting thanks to the anodized hardcoat, but the Extended Latch Charging Handle also comes with a lifetime warranty from Armaspec, just in case. 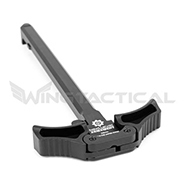 Armaspec strives to put out excellent-quality gun parts, and they’ve hit it out of the park with the Large Latch Ambi Charging Handle, with customers praising everything from the fit of the handle to how the design offsets some of the stress and lateral tension exerted on the latch roll pin and the charging handle itself. Since the original AR-15 was designed with right-handed shooters in mind, many left-handed users struggle to manipulate the charging handle. 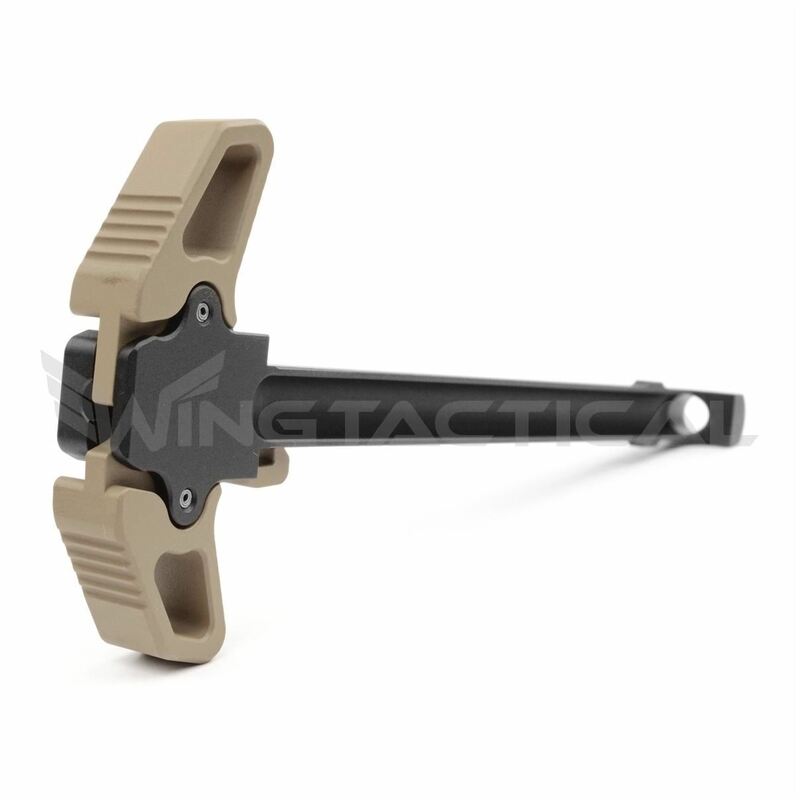 To combat this, Phase 5 Tactical released its Ambidextrous Battle Latch Charging Handle, which features a lever that extends to the right side of the latch, meaning that left-handed shooters can now more easily charge the weapon with their right hand. 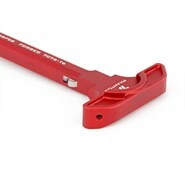 Aggressive serrations on the handle mean that no matter which hand you use, you can get a solid grip every time. Not only that, but Phase 5 Tactical have done away with the normal roll pin, replacing it with a .1875-millimeter coil spring pin made out of stainless steel, which allows for more uniform stress distribution. 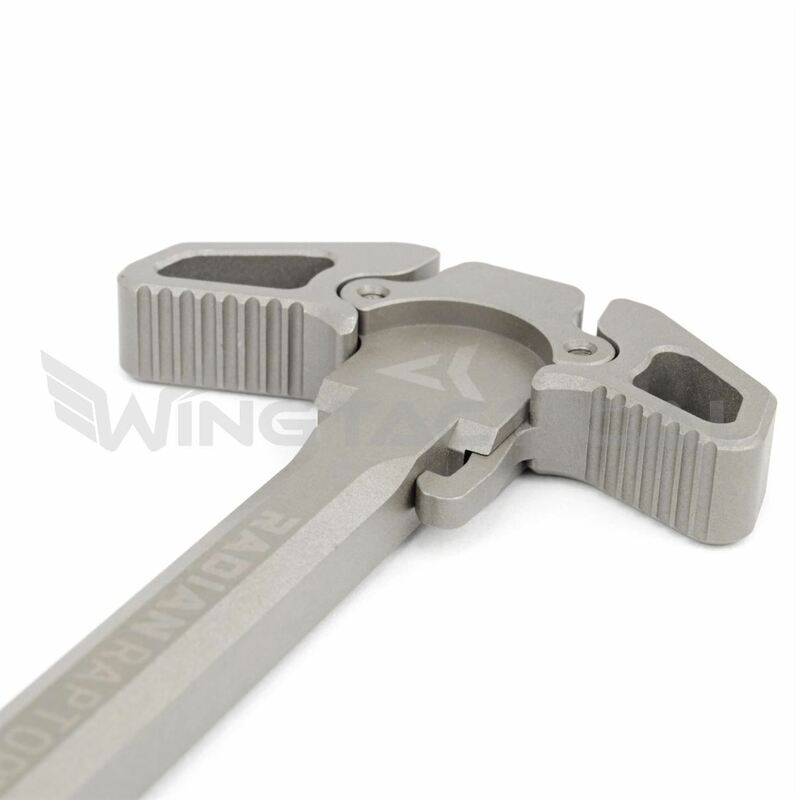 They have also thickened the charging handle’s side walls, increasing reliability and giving the charging handle more strength. 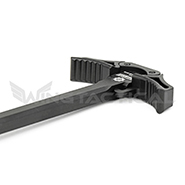 Phase 5 Tactical strives to put out some of the best-rated AR-15 charging handles on the market and the Ambidextrous Battle Latch Charging Handle is another product in Phase 5’s long line of quality firearms parts. The Next Level Armament NLX-556 Ambidextrous Charging Handle sets out to solve the problem that most left-handed shooters have when they pick up an AR-15: the fact that it’s built for righties. 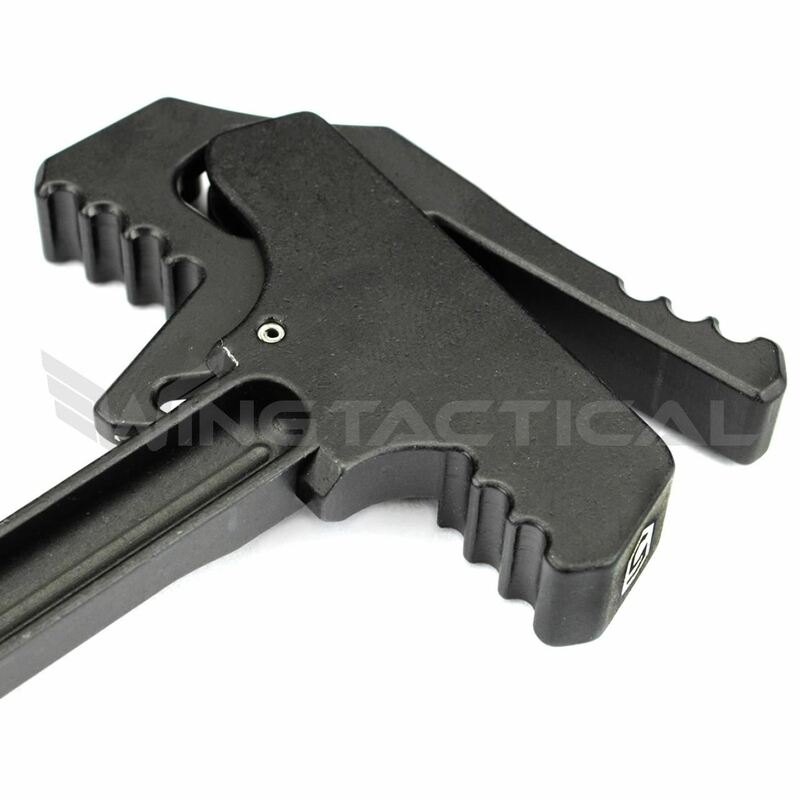 Instead of simply building a regular handle with a modified latch, Next Level Armament built two symmetrical latches in order to offer full ambidextrous functionality. In addition, each latch has been enlarged and then given aggressive serrations to make it easier for you the shooter to pull back the charging handle without the need for precise finger or hand movements. Even if you’re not a leftie, the Next Level Armament NLX-556 Ambidextrous Charging Handle can still work for you if you find yourself in conditions where you can’t use your dominant hand to fire your weapon, such as if you’re forced to fire over a barricade left-handed. 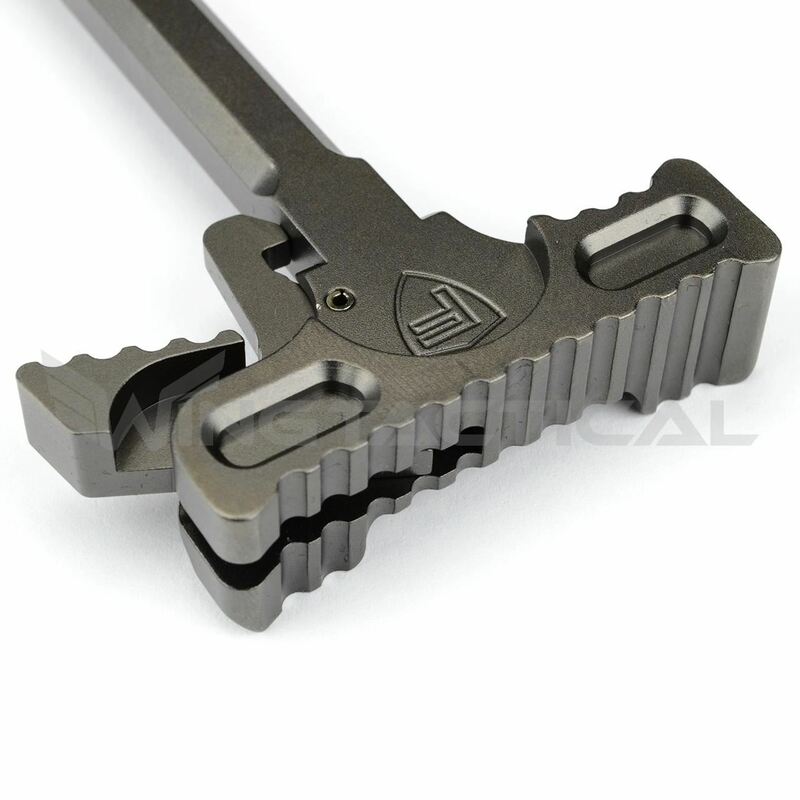 Next Level Armament strives to put out the best firearms products possible and the company’s ambidextrous charging handle is no slouch in that department: customers praised it for being well made, heaping particular compliments on the strong springs and large lever surfaces, as well as the heavy serrations. 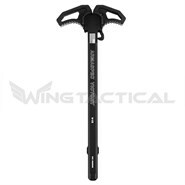 Ambidextrous Charging Handles -Ambidextrous charging handles are set up in such a way that the shooter can engage them equally well with either hand, meaning that left-handed shooters no longer have to fire their weapons right-handed. 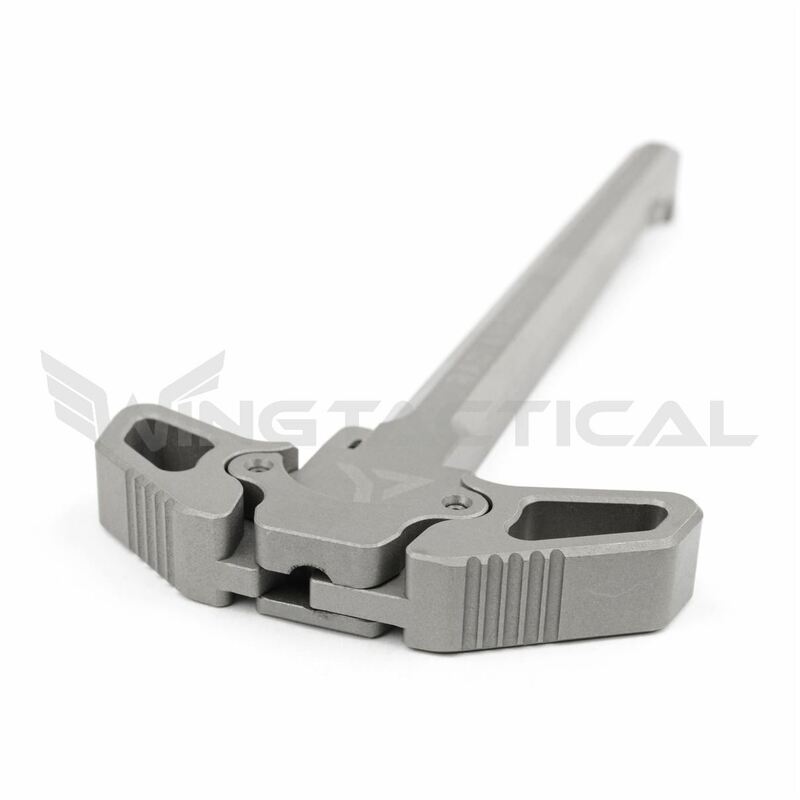 Extended Latches - An extended latch means that the latch piece of the charging handle is extended, allowing a shooter to more easily engage it while wearing gloves or during nighttime shooting or in stressful conditions. 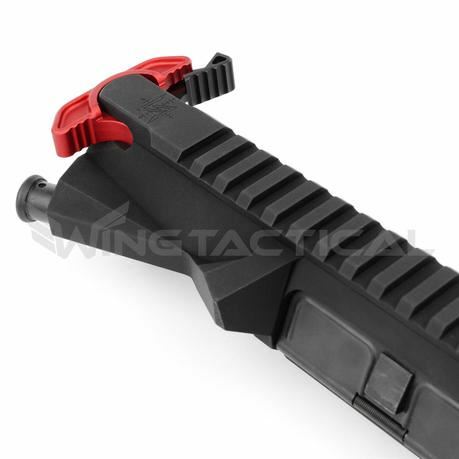 The extended latch also means that a shooter can engage their AR-15 with their foot, should the need arise. 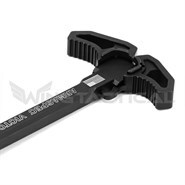 Gas Busters - Gas buster charging handles are designed to enable an AR-15 to be cycled when the shooter is using a silencer or is firing rim-fire .223 or 5.56x45 ammunition. They also have the added benefit of preventing gas or dust blow-back into the shooter’s face when firing. 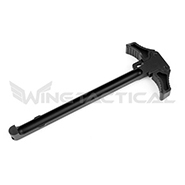 Wing Tactical has worked to provide customers with the best gun parts and accessories at the lowest price points possible. 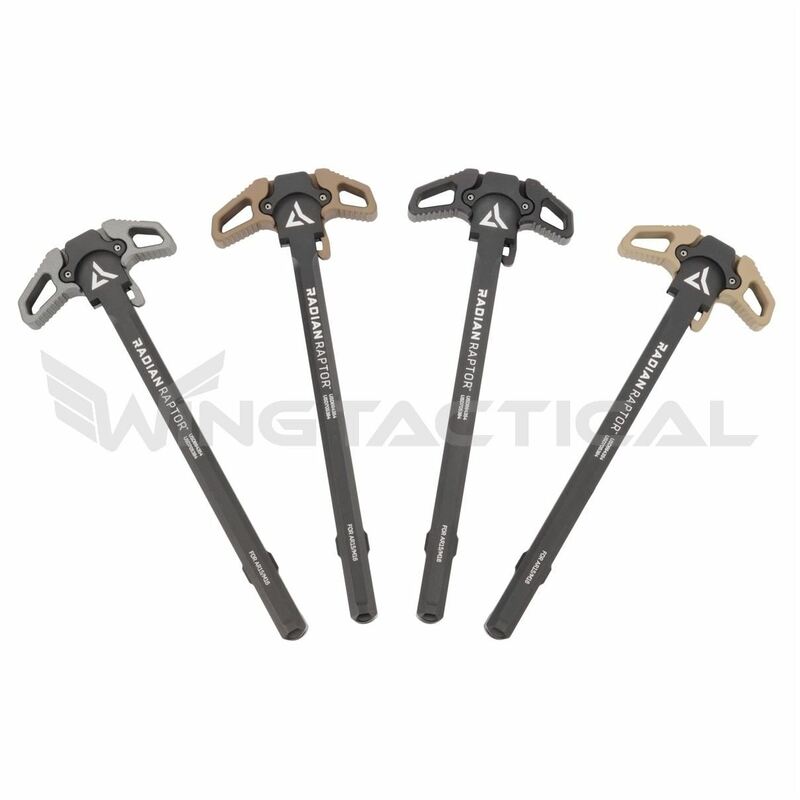 If you’re looking to upgrade your regular mil-spec charging handle to one that more suits your needs, take a look at the large number of charging handles Wing Tactical has to offer and pick out the one that’s right for your needs today.